SYRACUSE, N.Y. - A student at the SUNY College of Environmental Science and Forestry (ESF) plans to ride her bicycle from San Francisco to Washington, D.C., this summer to promote the use of sustainable forms of transportation. 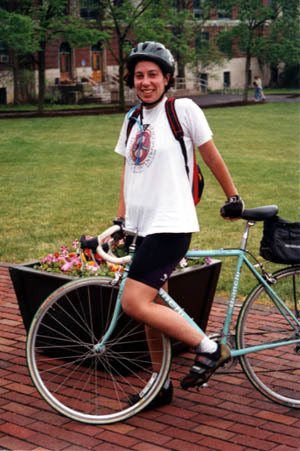 Sheryl J. Turk, a senior majoring in environmental studies-biological applications, hopes to raise $3,600 - or $1 for every mile she will pedal - as part of Bike-Aid '99 sponsored by Youth Action for Global Justice:JustAct. Turk said she is taking on the challenge to do her part to promote a cleaner, healthier planet. "I believe that if we remain silent and never share our ideas with each other, we will ultimately paralyze ourselves from ever achieving the ideal version of living in a sustainable community," Turk told her friends in a letter seeking pledges for her trip. She will be among 25 cyclists who leave San Francisco June 20. They are scheduled to arrive in Washington Aug. 21. Along the way, they will do volunteer work with housing improvements and bike trail construction. They will also participate in an educational program. JustAct works to develop young people's commitment to social and economic justice. The money the riders raise through pledges will be split among various grass-roots organizations in the United States and abroad; JustAct's partner organizations in Zimbabwe, Mexico, Bolivia, and the Philippines; and some JustAct programs. Turk is a resident of Orangeburg in Rockland County. She is a 1995 graduate of Pearl River High School and studied at the University of New Hampshire for two years before transferring to ESF. She expects to graduate in December. She is an experienced mountain biker who worked summers teaching outdoor skills to children at camps in New Jersey and Pennsylvania. She raised the money to pay for her trip - including the purchase of a new bike that cost $1,000 - through a series of minimum wage jobs.